Delving Deep Into the Wilds, into nature with its many forms, names, and intricacies, has been part of the Rite of Passage from childhood to adulthood for millennia. The experience of moving beyond the structure and confines of our daily lives calls to a deeper, timeless, and evolutionary truth that exists within each of us. You are invited Into the Wild, to push your own edges, and allow your future self to come into presence. This experience combines nature awareness, contemplative practices, elemental magic, and vision questing. In a series of connected challenges and ceremonies, we will re-wild our hearts, minds, and spirits — and then come back into community to reintegrate and reconnect with one another and the wider web of our human relations. 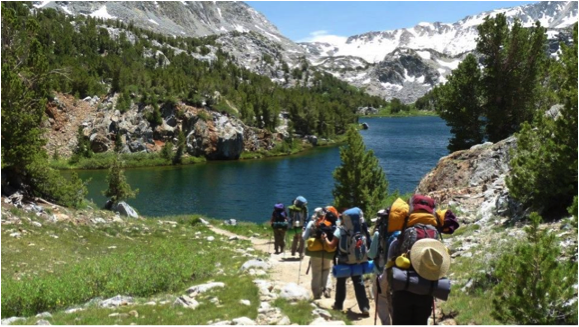 In this weeklong immersive, we will come together to support each other in preparation and then move out onto the land as a group to a series of camp areas — backpacking in all of our supplies and leaving no trace of our passage. As we move, we will learn to be who we are and where we are. We will experience a series of ceremonies, some facilitated by humans, some by the elementals and nature spirits, then hold silent vigil in a 24 hour solo vision quest. (The solo vision quest will be held within a safe distance to one other and the facilitators, if more connection is absolutely needed, but we are also committed to holding space for each other’s solo experiences). We will then come back together to integrate and claim the essential evolution and discovering of ourselves that has occurred. This experience is open to everyone between the ages of 18-25: those who have years of backpacking experience and those who have never slept in a tent; those who are confident in their physical strength and endurance and those who have read about nature much more than they’ve been in it; those who consider themselves spiritual folks and those who are new to magic or aren’t sure they believe in it anymore. It’s for those who are transitioning out of mandatory education and choosing their own path – whether in college, graduate school, or something else entirely — and who are moving into sovereignty and independence in their lives. It’s for those who feel ready to transition to being an adult – in their own way — and those who don’t. We will work with our hopes and fears, gifts and challenges, and help one another cultivate new skills, personal confidence, and wisdom rooted in the cycles of nature. Your guides on this journey are Anna Swisher and Jason Johnson, who bring a balanced mix of masculinity and femininity, magic and practicality, various shamanic and nature-based techniques and practices, decades of hiking and backpacking experience, and a shared passion for the beauty and wisdom of wild nature. Space is quite limited! Reserve your spot EARLY! Investment is contributed on a sliding scale. Please email (earthbodyyoga@gmail.com) for more information and to get started with registration!